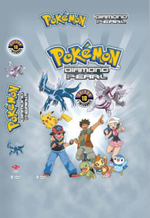 Description Découvre la première partie de la saison 10 "Diamant & Perle" de la série Pokémon ! Retrouve Sacha et son complice Pikachu, vainqueurs de la Battle Frontier, prêts à conquérir le continent de Sinnoh, ainsi qu’Aurore et Pierre passionnés par ces nouvelles aventures. 6 Disk Set - Can also be purchased as 2 x 3DVD sets. Setting Off! From Futaba Town to Masago Town! Rival Battle! Three vs. Three!! Pochama VS Subomie! Hikari's First Battle!! Forest of Hesitation! Shinji Again! Gureggru of the Mysterious Gym! Shapes of Things to Come! Kurogane Gym! Hyōta vs Shinji!! Big Charge of Ancient Pokémon! Return to Kurogane Gym! Decisive Match with Rampard!! Twice Smitten, Once Shy!パチリスゲットで・・・・・・大丈夫! ?Getting Pachirisu...... is fine!? The Strongest Koiking and the Most Beautiful Hinbass! Pachirisu VS Eipam! Contest Battle!! Roaring Haganeil! Protect the Bippa Village!! Cooking up a Great Story! Roserade the Mystery Man and the Flower Legend! Oh Do You Know the Poffin Plan! Deciding Match! Pochama VS Pottaishi!! Fuwante and the Carrier of the North Wind! The Champ Twins!サトシとヒカリ！タッグバトルで大丈夫! ?Satoshi and Hikari! A Tag Battle Will be Fine!? Satoshi and Hikari! A Tag Battle Will be Fine!? Hakutai Forest! Minomucchi Evolution Tactics!! Naetle VS Naetle! Speed Showdown!! I like it! Pokémon Roleplay Tournament!! Buizel! The Road to Strength!! Elite Four Goyō and Dootakun! Hikari, Nozomi and a Double Performance!! Mumage! Escape from a Nightmare!! Save the Stray Child Hipopotas! Hunter J Returns! Protect Tatetops!! All Members Participate! Tag Battle!! Hikozaru VS Zangoose! Battle of Fate! !